Taps stolen??? What the hell ... Why would someone bloody steal the taps /... A.HOLES ! N then we complain we dont find honest rulers? Even with honest rulers, we cant change. I undertook my maiden journey on M3 yesterday (14-Apr). 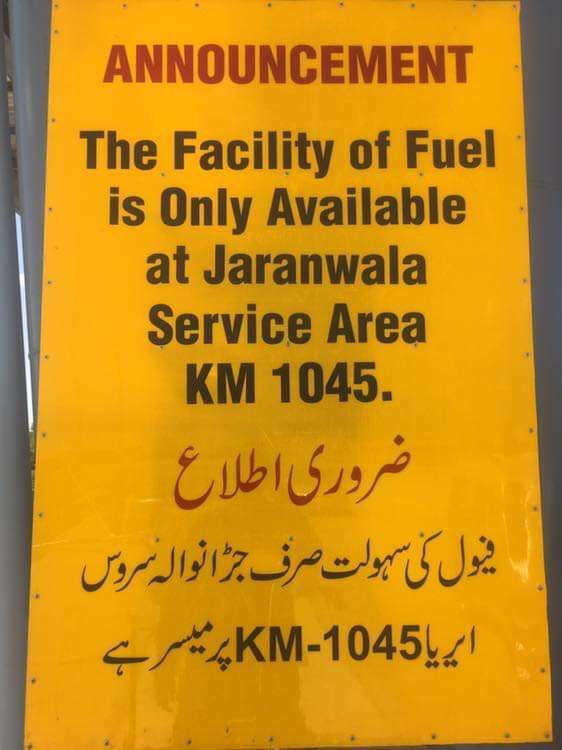 As for the Service Areas, the one in the middle close to Samundari is only partially opened as stated by Shafeeque. Only Mosque and the washrooms in it are open. A few vendors have placed their stuff in chest freezers out in the open for drinks, snacks etc. The washrooms are in extremely bad shape as is expected from our populace. Even a few taps have been stolen already. If hygiene is not your concern, you can stop by here and use the washrooms. I used the Kacha Khu to Abdul Hakim route to enter the M3, as per recommendations on this thread. Traffic frequenting it is already at par with M2. Its like people were desperately waiting for it. However the real benefit and relief will only be when the Khanewal interchange becomes operational. Thanks all for your guidance and advice. Yes, better stop over there. And you'll reach to Lahore in 2hr from Abdul Hakim. Try entering Lahore before 5pm to avoid traffic rush at Ravi Toll Plaza. Wait for that wrong way corolla. This nation cant be sensible, never ever. Its a bet. Last edited by AhsanJutt; April 19th, 2019 at 02:55 PM. Wrong Corolla lol. Anyway in both videos I noticed the rubber speed breaker leading up to Abdul Hakeem Interchange toll plaza is very hard. Cultus walay baba ke toh wiper hi chal paray jhatkay se. They should either make it a bit softer or maybe start using more rumble strips, its not bad on the car bas vibration se tabiyat seedhi ho jati hai. Bahi g Corolla car walay ki ghalti to nazar aa gi. But yh 2nd video mein 8 sect par ek bike nazar aa rahe hy. Yh bike walay kasay moterway par safar kar rahy hain? Can anyone please guide which interchange is best for the exit to Jhang Bypass? Which road is good for travel the Samundri gojra road or Toba Tek Singh Road?